Morning, Dish friends! I finally made it home from RWA last night - hot, sweaty, exhausted and five hours later than originally scheduled. I dragged my luggage (filled with books and other goodies we'll be giving away here at the Dish) into the condo, sat down on the couch, promptly fell asleep...and didn't wake up until 9:30 this morning. 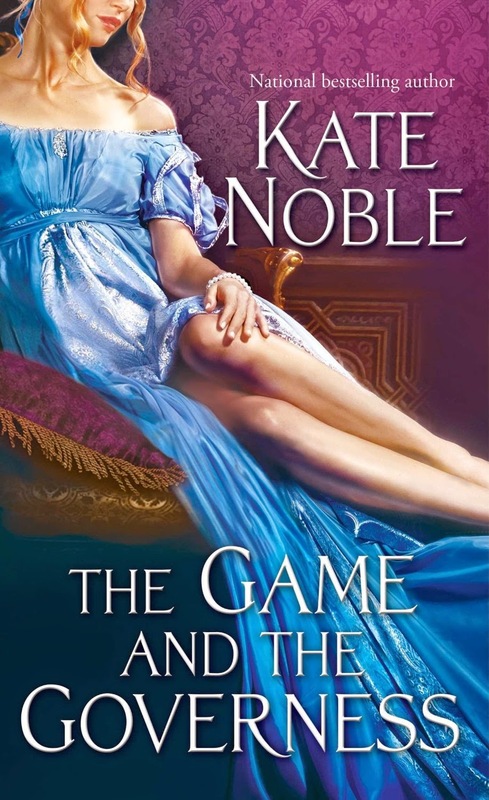 So, while I upload photos, write RWA blogs and give my poor, neglected dog the attention she deserves, please enjoy this review by Janga of The Game and the Governess by Kate Noble. It's the first book in what looks to be a terrific new series and, like Janga, I loved it. Don't forget to check back later for installment one of What Happens in San Antonio! Ned Granville, Earl of Ashby, is known as “Lucky Ned” because of his phenomenal luck. He has proved lucky with cards, lucky with women, lucky in inheriting a title that, barring a tragic accident, should never have been his, and lucky to have returned from the Napoleonic Wars a hero. So confident is he of his luck that when his friend and secretary proposes a wager, Ned, after some hesitation accepts. If Ned can persuade a lady of good breeding to fall in love with him, not as the Earl of Ashby but as Mr. Turner, the Earl’s secretary, within two weeks, he will win the family mill that Turner has dedicated himself to restoring. If Ned fails, he will pay Turner 5000 pounds. The proof of Ned’s success is to be a dance, a token of affection, and intimate knowledge of the lady. The need to make a decision about the cottage and land he inherited from his mother provides a setting far enough from London to make the exchange possible. The two men, having exchanged identities for two weeks, set out for Hollyhock, a small town in Leicestershire where Ned lived in genteel poverty with his mother until at the age of twelve he became heir to his present title. Ned’s life moved from poverty to privilege; Phoebe Baker’s journey was the reverse. She was only seventeen, still a student at an exclusive school for girls, when her father’s death left her destitute. No longer a cherished, sheltered young lady looking forward to a London season, she was suddenly a young woman on her own with no money, no family, and only references and the name of a family in need of a governess as a means of survival. Before she is forced to leave the school, Phoebe writes a letter to the man she holds responsible for her plight, an aristocrat who allowed a thief free to prey on others rather than appearing foolish in the eyes of his peers. Phoebe’s father was one of his victims. Phoebe swears if the opportunity ever affords, she will see that the aristocrat suffers the consequences of his action. The letter is addressed to the Earl of Ashby. When Ned and Turner arrive at Puffington Arms, the home of Sir Nathan and Lady Widcoate, where they are to stay for their two-week visit to Hollyhock, they find a house filled with ladies, all of them interested in the Earl of Ashby and none of them interested in his secretary. When it becomes clear that Ned’s contact with the ladies in the party will be severely restricted, he focuses his attention on the thin, plain governess, particularly after he discovers that she once attended a prestigious school for girls, thus qualifying her as a lady and the likeliest candidate to help him win his wager. Phoebe does her best to avoid attention and blend into the background, but Ned’s persistence and charm gradually erode her defenses. Even more gradually, Ned finds himself captivated by Phoebe’s humor, courage, and quiet beauty. But the more deeply Ned falls in love, the more he recognizes the consequences of the deceit in which he has chosen to engage. A careless wager may cost him what he wants most. Noble gives her readers an intricate plot and a sizeable cast of characters in a story that is part romantic romp, part moral tale. The switched identities predictably lead to some humorous moments, and the secondary characters from the Widcoates and their guests to the townspeople are generally amusing. Ned is totally unprepared for the realities of life without the privileges that he takes for granted. Noble takes something as simple as bath water to draw chuckles and to make her reader aware of how encompassing the hierarchical structure of her world is. The taciturn, introverted Turner is no more prepared for the social responsibilities and lack of solitude that comes with Ned’s title than Ned is for the lack of status his secretary is given. Both men learn from the experience. Phoebe is a wonderful heroine. She possesses intelligence, strength of character, a lively sense of the ridiculous, and integrity in the fullest sense of that word. She has a rare wholeness in that there is little distance between the beliefs she espouses and the way she conducts her life. The reader first sees her as a hurting, angry young woman who is given sound advice by one of the teachers as she leaves the school where she has spent five years of her life. Phoebe’s decision to follow the advice rather than surrender to bitterness occurs offstage. What the reader sees is Phoebe putting the advice into practice. She is not perfect (Thank goodness! ), but she is an interesting, appealing, admirable heroine. In the early chapters, Ned is an arrogant, self-absorbed young aristocrat bored with life. He is a man who lives on the surface, using self-indulgence to avoid thinking deeply about anything. While experiencing life as an earl’s secretary increases his awareness, it is his relationship with Phoebe that truly changes him. Although it happens in a way far different from that which the young Phoebe had envisioned, she does indeed show him that choices have consequences. Frankly, I found the first part of the book rough going because I disliked the hero, but the hero’s growth is central to this story. Ned grows into a man with a keener mind, a sharper conscience, and a larger heart, and I loved watching his growth. If you like romance that combines the light and the substantive, I highly recommend this book. I have added it to my list of the Best of 2014, and I eagerly await John Turner’s story and hope for the story of Ned and Turner’s doctor friend, Rhys Gray, as well. Janga, thanks for the review. I love Kate Noble's stories, and this one sounds wonderful! I really like the premise of this story and am adding it to my TBB pile. It's a terrific book, Deb. Like Janga, I didn't care much for the hero for the first half of the story but stick with him. It's worth it in the end! I agree - love her books and from your review, this sounds like another great read! Sounds wonderful! Adding it to my TBB list now. It's a beautifully written book, Cheryl. Hope you like it! Welcome back to you. Cannot wait to hear about all the fun you had. WOW! 5 stars, Janga's Best of 2014 List and Janga and PJ both recommend it. Sounds like a must read! This series sounds like a must read for me. Thanks for the review and letting us know about another good book by Kate Noble.